San Francisco based filmmaker Lynn Hershmann Leeson is a nominee for the the San Francisco film festival's Persistence of Vision Award, presented annually to honor the lifetime achievement of a filmmaker whose work is crafting documentaries. Leeson's work has frequently combined art with social commentary, particularly on the relationship between people and technology. 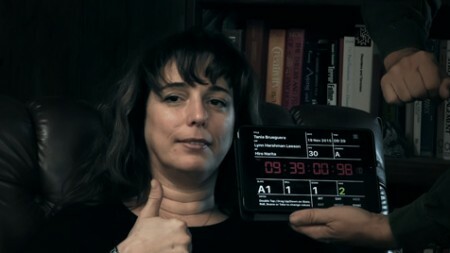 Her new film Tania Libre is an empathic documentation of a series of counseling sessions with Tania Bruguera, one of Cuba's most famous performance artists, by Dr. Frank Ochberg, a specialist in post traumatic stress disorder, conducted when Bruguera was released following her arrest, revocation of passport, and eight months of house arrest in Cuba to prevent a work of protest art. Discussions between Tania and the doctor in the film reveal something about artistic and political repression in Cuba, and (briefly) Bruguera's fraught relationship with her own family, itself tainted by the Cuban system of state repression. She had learned her own father was a government spy. Perhaps partly as a result of her therapy, Bruguera has declared she intends to run for president of Cuba in 2018, when Raúl Castro is scheduled to step down, though this is not mentioned in the film. Rather out of the blue, Dr. Ochberg talks about his role as a consultant and expert on the Stockholm Syndrome in the case of Ariel Castro in Chicago (no relation to Fidel! ), the man who kept three women prisoner for many years. (A clip and a clipping are shown to show the doctor speaking in court.) He suggests this syndrome relates to the behavior of Cubans to Castro or to people oppressing them, such as security officers interrogating Bruguera in the past. Though they are being filmed, Dr. Ochberg and Bruguera do seem relaxed, both used to performing in public, and seem to communicate well. Isn't this film one of her performances, and the good doctor and the filmmaker her willing collaborators? As the Cuban government has been, it turns out. The performance artist can bend anything to her needs. For example, June 7, 2015, trying to prevent her from disrupting the Havana Biennial exhibition of art with a 24-hour-long public loudspeaker-broadcasted reading of Arendt’s Origins of Totalitarianism from her doorway (not exactly a subtle gesture), a spectacle the government felt was too hot to handle, they tore up just the block of her old town house with rock drills for one week to drown out the sound. She was able to read a key part during the workers' lunch hour, an opportunity she describes as "the most beautiful thing for me." At the start and end, the film is bookended by statements about "art" by Bruguera read by Tilda Swinton in her quiet, high-toned voice. These statements are valid for engagé, political artists. "Artists have the right to disagree with power." Of course they do. Everybody does. But it's not the main concern of every artist to disagree with power. It is Tania Bruguera's. What emerges from this film, though of course it's only one artist and one psychiatrist, is that at least with an artist as political and as provocative as Bruguera, the Cuban regime has been very heavy handed. Nevertheless the scope of the film feels narrow, and it could have told more about this artist and her work. Though Bruguera agrees with the doctor that humor is necessary to mental health and says she takes care of that need, her work would appear to leave little room for lightheartedness. Her father was an associate of Fidel; but despite the parting of ways, she says he respected her for her courage. Tania Libre, 71 mins., debuted at the Berlinale 14 Feb. 2017, and is also shown at the SFIFF, and as part of the latter was screened for this review. SFIFF showtime and award: April 11, 2017 at 7:30 pm at Yerba Buena Center Theater. Last edited by Chris Knipp; 04-08-2017 at 08:59 AM. A film about awakenings, Miwa Nishikawa's The Long Excuse shifts focus. First it's on Sachio (Masahiro Motoki of Departures ), a novelist and minor TV celebrity past his prime. When first seen he's a cad who's rude to his hairdresser wife Natsuko (Eri Fukatsu), and totally self-centered when she dies in a bus that crashes into a frozen lake. He's sleeping with another woman when he gets the news. He lays his grieving on heavy for public attention but feels nothing. Attention shifts to Yoichi (Pistol Takehara), truly grieving his wife, a friend of Natsuko's who died with her. Nishikawa, who bases this screenplay on her own novel, loads the dice, giving Sachio a life that favors superficiality and making Yoichi a truck driver who's not too bright so he can be a direct, simple guy. It works though. Attention shifts again when Sachio helps Yoichi take care of his pre-middle school son Shinpei (Kenshin Fujita) and preschool daughter Akari (Tamaki Shiratori) because Yoichi can't cope. This enables Sachio to feel good about himself and delay facing the loneliness of his own grief. Action spans a year and Fujita, visibly growing into adolescence and rebellion, bright, angry, and at odds with his simple dad, steals the show, though the two adult males do some noisy fighting and growing up. Some interesting bonding and reality-checking take place here. Nishikawa doesn't avoid sentimentality 100%, but this is an interesting watch with fresh female angles on Japanese family life. The Long Excuse/Nagai iiwake/ 永い言い訳, 124 mins., debuted at Toronto Sept. 2016; ten other festivals including the San Francisco International Film Festival, as part of which it was screened for this review. Last edited by Chris Knipp; 04-13-2017 at 01:34 PM. 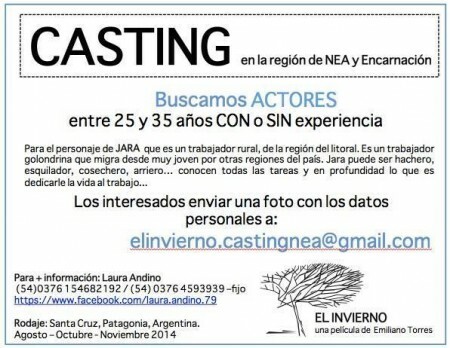 Set in southern Patagonia, Emiliano Torres' The Winter/El Invierno focuses on a young man, Jara, (Argentine Cristian Salguero of Paulina) brought in to replace the aging foreman of a vast estate, Evans (Chilean Alejandro Sieveking (The Club) . As winter comes on Evans, who's been forced to retire and has no future, mysteriously returns and tries to force Jara to leave. Some critics found this to have an unnecessary slow festival style that this time I thought fitted the material like a glove. Neil Young of Hollywood Reporter calls it "a compendium of brooding slow cinema tropes," and Mike D'Angelo, who's much nicer on Letterbox'd ("Solid Argentine debut"), says "he's got the current languorous arthouse rhythm down pat." But even if it's "slow" and the contrasted men, the old and the young, are exceedingly laconic, it (to quote D'Angelo again) turns "into a low-keyed thriller" when it " really sparks in the second half." It becomes a desperate Wild West battle between the two men, one of whom we've followed for a while, who disappears and is sensed only in what we see of him later through the other's eyes. “This is a story of survivors," Torres himself has written, "in a corner of the world where time has stopped and winter seems never ending, where isolation, alienation and that strange and violent harmony we call nature conditions everything.” Those dramatic statements - the vast open spaces seem to inspire them - aren't wholly true in Torres' own story, since time is moving on, not just for the men but for the estancia, and it's not exactly nature that "conditions everything" at this point but the global economy making the place outmoded. To assert that fact, as Torres' story does at the end, isn't a needless invasion of modernity, because these are gauchos, cowboys; and cowboys are always outmoded, a fact that it's a tradition of the modern Western to take note of, I believe. It shouldn't be overstressed, though, because the struggle for men to survive in this barren land and the individual battle between Jara and Evans is classic desperate thriller stuff of men in extremis. What comes through strong and clear is a harsh and chilly atmosphere, the quintessential mood of austere ranching in the Patagonian waste. The men wear berets and rugged layered clothing that might serve as a model for the Filson company of Seattle. No fleece or down. They ride pretty horses. Jara, the newcomer, has to rope a young one and make it his own. They saddle up with minimal gear, a network of ropes, and they work from five a.m. to five p.m. herding sheep on horseback with dogs. Neil Young bewails the emptiness of the plot. Actually even in the first twenty minutes there's a fight, a whore's brought in to entertain the bored men and they get wine and dancing; new owners appear, speaking French, with guests, bewailing competition from China and explaining that the extent of the property is "enorme." And while Jara and Evans are already eyeing each other, Jara is whittling a small wood horse whose significance will appear later, as will that of the French visitors and of Evans' late night violent drunken episode. As D'Angelo points out, "Torres excels at introducing details that will have payoffs but don't advertise themselves as setups." As Jara Cristian Salguero sports a wild, unruly look though it falls to him to maintain order. He arrives with other ranch hands as if he's just another peon but he has many skills, which the actor recruited was expected to have too, as shown in the casting call notice shown below. You feel the atmosphere here in your bones. This is a tale worthy of Cormac McCarthy or Annie Proulx. Torres has frequently been an assistant director, and he has written scripts for a number of Latin American directors. This is his feature debut, and it's a very promising one. Once again the arid terrain of Patagonia has proven cinematically fertile. 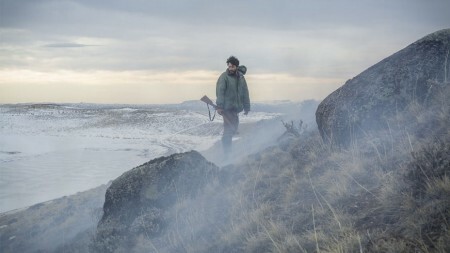 Winter/El Invierno, 95 mins., debuted at San Sebastián 21 Sept. 2016; also Zurich, Palm Springs, Villeurbanne Festival Reflets du cinéma ibérique et latino-américain. New Horizons in Poland coming 4 Aug. 2017. Screened for this review as part of the San Francisco International Film Festival. SCHEDULE SFIFF: Apr. 14, 2017 at 8:30 pm, Alamo Drafthouse New Mission; Apr. 15 at 6:30 pm at Berkeley Art Museum Pacific Film Archive. Last edited by Chris Knipp; 04-15-2017 at 11:33 AM. The title of this "documentary" - a clumsy term for something so handmade and unique in texture - is drawn from a verse by Marxist revolutionary Spanish poet Rafael A;lberti. Harvard's Sensory Ethnography Lab person J.P. Sniadecki has collaborated with the Canadian Joshua Bonnetta for a most poetic treatment of their theme: the boundary in the Sonoran desert between Mexico and the United States that has swallowed up so many who have sacrificed everything to come to El Norte. The film could have been a straightforward record of human tragedy, but it is more indirect. It begins and ends primarily as a record, on digitized 16 mm, flickering, grainy, gray and chiaroscuro, of the natural landscape, only indirectly of the human. It ends with a vast stormy sky over the grainy image of the flat, implacable desert. It is punctuated and populated by a rich sound record of nature and a few human voices telling sad stories but unseen. In a mid section, "Costas," it stops to linger over closeups of ID cards and a cheap phone in the sand, personal objects forgotten along the way. Bonnetta and Sniadecki were inspired by a chance conversation with a border guard, and then by reading a book by Jason De León, The Land of Open Graves. They spent three years filming the landscape, recording its wildlife and talking to border rangers, aid workers and human smugglers ("coyotes"). The film's first section “Rio,” delivers a flickering landscape that seems to move because the camera is mounted in a car advancing at high speed: the bars of a fence create a beautiful abstraction. This is an exploration that, while being painful, transforms ithe nightmare territory of its focus into a beautiful hallucination of lights and colors. There have been a series of crossovers in these Harvard ethnography laboratory-inspired documentaries, whose subjects have ranged wide but techniques and focuses have had common threads. (See Michael Sicinsi's rundown of the main films concluding with El mar la mar in Arsenal "Berlinale Forum".) Ilisa Barbash and Lucien Castaing-Taylor made Sweetgrass (NYFF 2009); Sniadecki and Verena Paravel made Foreign Parts (NYFF 2010); Paravel and Lucien Castaing-Taylor made Leviathan (NYFF 2012); Sniadecki and Libbie D. Cohn made the 2012 People's Park (ND/NF 2013). These have been well-seen and reviewed in international film festivals. These are core works whose influence extends outward, informed by an ethnographic and anthropological focus. They are at once an intense physical experience and an exercise of detachment involving precise sound recording and unusual camera placement. The sound was recorded from a long distance in the sheep herding film Sweetgrass; in the marathon examination of factory fishing tiny cameras were attached to fishermen's bodies in Leviathan. This new look at migrations from the south eschews conventional documentary style. It swings from sweeping distant images to almost microscopic closeups of the ground. Auxiliary documentation of the human experiences buried in the desert is provided by voiceover. Some reviewers have found this partially abstract film, that has no conventional talking heads, an odd way to approach the subject of the US-Mexican border. But anyone familiar with the Harvard Sensory Ethnography Lab will find it very much what you'd expect, though it gets more explicit and political than before. The Sonoran Desert is a daunting natural landscape and a human graveyard. Crossing it takes three to five days and in summer daytime temperatures exceed 104ºF. Remains of over six thousand dead reportedly have been retrieved by Border Patrol and thousands more may have been bleached away by the scorching sun before they were found. It's inhabited by cacti, poisonous insects, rattlesnakes and jaguars and it extends over a territory of over 100,400 sq. mi. along the US-Mexican border; the 1900-mile boundary between the two countries here is at least one third fenced, and has been heavily patrolled with men and drones since the Nineties. It's worth noting that illegal border crossings have dropped considerably, to perhaps a tenth what they were a decade ago. As has been frequently pointed out Donald Trump's extremely costly proposed continuous wall along the border, an outmoded and inefficient measure to begin with, would come at a time when it is much less needed than in the past. The filmmakers have pointed out that the border is designed to funnel illegal crossers through the desert and make desperate outcomes seem their personal choice. Voiceovers tell harrowing and tragic tales over a black screen with nothing to distract from them. Clearly Bonnetta and Sniadecki's sympathies are with the Mexican border crossers, but they don't demonize the US guards, who are heard from speaking in a sympathetic manner. The final section, “Tormenta," is a kind of epilogue that carries the theme to the realm of the spiritual. 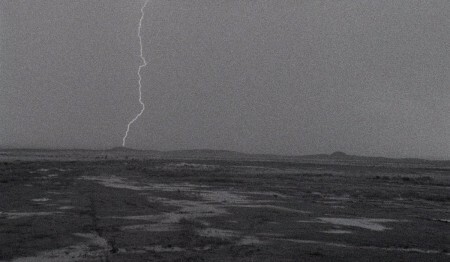 It consists of the grainy distant stormy desert landscape (characteristically, both neutral and awesome), with the voiceover of a woman reading portions of various verses from Mexican poet Sor Juana Inés de la Cruz. This is clearly the Sensory Ethnography Lab's most poetic and passionate film so far - though it may be just as off-putting to mainstream viewers. El mar la mar, 94 mins., debuted at the Berlinale Feb. 2017 with two awards and one nomination; also shown at the San Francisco International Film Festival, as part of which it was screened for this review. Coming festivals include Hong Kong. SFIFF SCHEDULE: Apr. 6, 2017 at 8:45 pm at SFMoMA; Apr. 12 6:30 pm at YBCA Screening Room; Apr. 16 8:15 at BAM PFA. Last edited by Chris Knipp; 04-15-2017 at 11:58 AM. This movie's title reveals that it's not going go anywhere revolutionary, but it could provide valuable material for a film course. It's strictly talking heads. Among the couple dozen Hollywood composers heard from it's mainly the most famous highly paid ones like Hans Zimmer, Danny Elfman, John Williams, Trent Rezner, Alexandre Desplat, Heitor Pereira, who get to sit in front of the biggest electronic mixer consoles, conduct the biggest orchestras in the biggest halls, and drive the poshest hundred-thousand-dollar sports cars. And of course we hear about Bernard Hermann and John Williams. They all love what they do - and who wouldn't? Their big loud sound is essential to blockbusters. The possibility of only classical soundtracks, like baroque for Malle's The Lovers, jazz by Miles for Elevator to the Gallows; purely diegetic music in film or no music in a movie at all, just interesting sound design, isn't considered here. A fan film and a promotional film good for TV that will please blockbuster fans, superhero movie fans, Transformers fans. And I admit, I love Titanic and Cameron may be right right here when he says a director's choice of music is key. Was Bernard Hermann's famous screechy sound in the Psycho shower murder essential - or could the sequence be even scarier without it? This film doesn't encourage us to ask such questions, but it provides good material for debate. A book, SCORE: A Film Music Documentary - The Interviews edited by Schrader and Trevor Thompson will be published 9 May 2017. 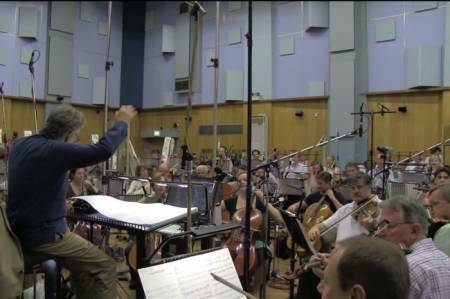 Score: A Film Music Documentary, 93 mins., is Matt Schrader's debut. Eleven festivals starting with the Hamptons Oct. 2016, including San Francisco where it was screened for this review. Theatrical release in the US and Canada 16 Jun. 2017. SFIFF SCREENINGS SCHEDULE: 1 PM 9 9 Apr. 2017 Dolby Cinema; 3 pm. 11 Apr. SFMoMA; 8:30 pm. 17 Apr. Victoria Theater. Last edited by Chris Knipp; 04-15-2017 at 07:11 PM. O'Shea's radically realistic teenage vampire movie is depressing, but in a good way: it's (half) very downbeat ending is curiously satisfying. Milo (Eric Ruffin) is a kid who thinks he's a vampire - or maybe he is one. If it's a terrible fantasy we gradually can realize why. He's black. It's summer. The kids and gang members at the Brooklyn projects where he lives haze and abuse him. His older brother Lewis (Aaron Clifton Moten), a war vet who sits watching TV all the time, is no help. When a white girl, Sophie (Chloe Levine) arrives to live with her abusive grandfather, they strike up a romantic relationship, which is a comfort, but only partially. Milo used to kill animals, and he's become a monster, and he knows it. 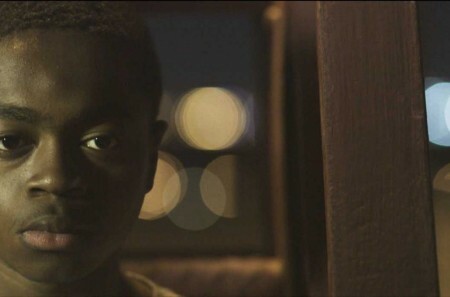 The Transfiguration, 97 mins., debuted at Cannes May 2016 in Un Certain Regard, followed by 19 other international festivals including SFIFF, as part of which it was screened for this review - but it is in limited release by Landmark as of 7 Apr. 2017, coming elsewhere in subsequent weeks. The Metacritic rating of 61% shows a generally solid but reserved reception now. SFIFF SHOWTIMES. It showed 7 Apr. 2017 at the Roxie, 9 Apr. at Pacific Film Archive; one last chance Sun., 17 Apr. 5:30 pm at Alamo Drafthouse, San Francisco. Last edited by Chris Knipp; 04-16-2017 at 10:03 AM.